In 1984, the Peppers brand was conceived when Mike and Suzi O'Connor opened Peppers Guest House in the Hunter Valley, NSW. Their vision was to create a contemporary style guesthouse offering relaxation in luxury surrounds. It proved an instant success.Today you will find the Peppers collection of Retreats, Resorts & Hotels in extraordinary places throughout Australia, New Zealand & Asia Pacific. Peppers destinations are set among rainforests, vineyards, on cattle stations, mountain ranges, golf courses, cities, beaches and tropical islands, each property boasting its own individual charm and character. 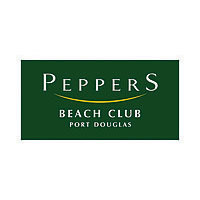 Peppers Beach Club Port Douglas is a combination of beautifully appointed accommodation with luxury resort facilities. The resort's elegant open-air design is reminiscent of a Mediterranean villa. Accommodation comprises of spa suites and one, two and three bedroom suites, some complete with private swim-up pool decks. An exclusive spa, freeform pool, fitness centre and signature restaurant make Peppers Beach Club one of the best Port Douglas resorts.